The worst part of cooking at home: the mess you have to clean up afterward. Problem solved. 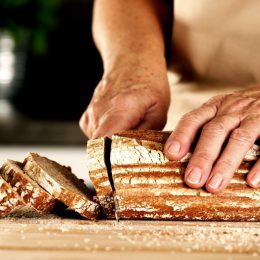 There are plenty of people who truly love to cook. But washing a giant pile of dirty dishes? Good luck finding anyone who enjoys that. 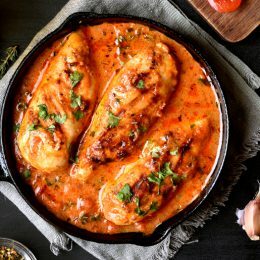 There may not be a cooking method that’s totally dish-free, but there are plenty of delicious homemade meals that only use a single pot, pan, or skillet. In other words, cleanup is a piece of cake. 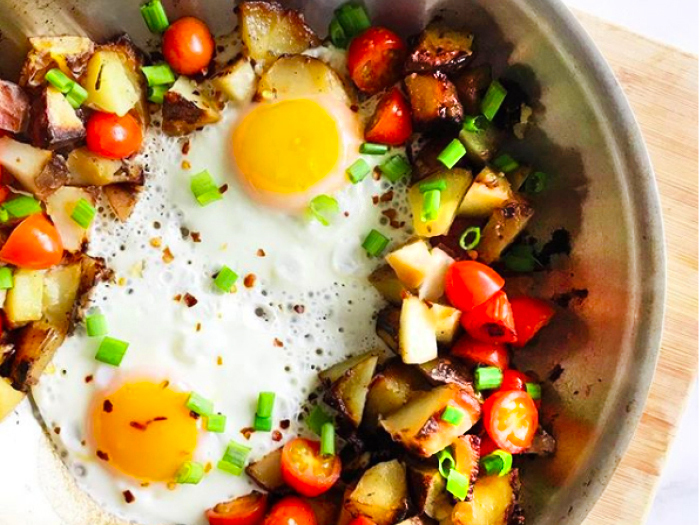 To make healthy eating at home much less labor-intensive, we asked top dietitians for their favorite one-pot, one-pan, or one-skillet recipes. The only rules: It must be truly satisfying, easy to make, and deliver key nutrients like protein, fiber, and healthy fats. Here are the six incredibly simple meals they delivered. The beauty of this recipe is that it’s easy to customize based on what you have on hand. Kathleen Meehan, R.D., cuts the cook time in half by using leftover roasted potatoes whenever possible. You can also add or swap any vegetables you like. What to do: Preheat oven to 400°F. Meanwhile, heat olive oil in a small cast-iron skillet over medium heat. When the oil is hot but not smoking, add potato and paprika, and season with a pinch of salt and pepper. Place the skillet in the oven to bake for 20 minutes, or until potato has started to soften. Add cherry tomatoes and scallions to the skillet, and toss to combine. Crack eggs on top, and season with another pinch of salt and pepper. Bake 10 to 15 minutes more, until potatoes are cooked through and eggs are set. 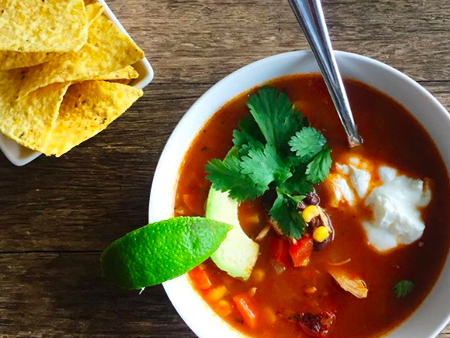 The perfect combo of spices and a jar of salsa adds serious flavor to this one-pot soup from Angie Tillman, R.D. Look for low-sodium salsa without much—if any—added sugar, and add any toppings you like. What to do: Add olive oil to a large pot over medium heat, and sauté chicken until opaque on the outside, about 5 minutes. Add onion and cook until softened. Season with salt and pepper to taste. Add garlic, cumin, and chili powder, and stir 30 seconds, until spices are fragrant. Add chicken broth, corn, black beans, and salsa. Reduce heat to low, and simmer for 20 to 30 minutes. 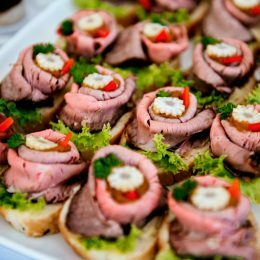 Serve with any optional toppings. Meehan swears by the easy dinner, which can easily be scaled up or down depending on how many people you’re feeding. 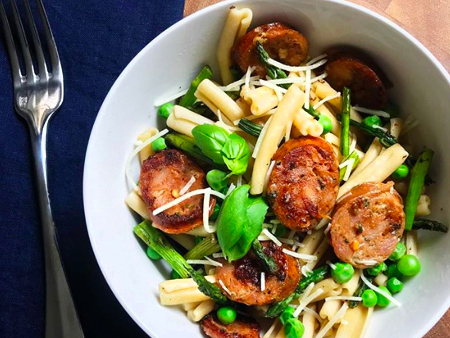 “The asparagus and peas in this recipe make it a perfect spring dinner, but you can customize for any season by swapping the asparagus with carrots, green beans, parsnips, or even Brussels sprouts,” she says. Frozen peas are easy to find all year, so no need for an alternative there. What to do: In a medium pot, cook pasta in salted water according to package directions. In the last 3 minutes of cooking, add asparagus and frozen peas to the pot. Drain into a colander, and set aside. Dry the pot with a clean towel to use again. Return the pot to medium-high heat. Add olive oil and sausages. Cook sausages until browned on all sides, about 4 minutes. Remove sausages from the pot. Let cool slightly, and thinly slice into coins. Return sausages to the pot to brown, about 2 minutes per side. Add cooked pasta and vegetables, basil, and Parmesan, and toss to combine. The next time you’re craving comfort food but don’t really feel like cooking, this recipe is the solution. Jennifer McDaniel, R.D.N., came up with it one Halloween, when she had hungry kids to feed and no time to waste. So, she came up with an alternative, which requires only a few ingredients and a single pan. McDaniel recommends using a jarred marinara sauce that’s low in added sugar and sodium. What to do: Preheat oven to 400°F. Meanwhile, spray an 8- by 13-inch baking sheet or a large cast-iron skillet with nonstick cooking spray. Add marinara and spread evenly in dish. Slice chicken lengthwise until ¼-inch thick. Place chicken on top of marinara. Slice mozzarella to ¼-inch thick, and place over chicken. Bake for 20 minutes. 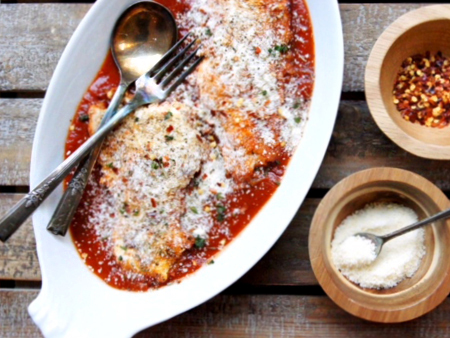 Sprinkle Parmesan and breadcrumbs across dish. Bake for an additional 10 minutes. Your chicken should reach an internal temperature of 165°F. If it’s not there yet, bake for an additional 5 minutes. Remove from oven, and sprinkle with your choice of fresh chopped herbs. 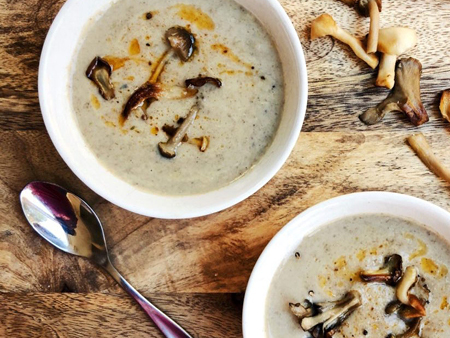 This creamy soup from McDaniel offers a comforting texture, rich flavor, and big dose of nutrient-packed vegetables. If you want leftovers that will last all week, use a big stockpot, and double the recipe. What to do: Heat butter and olive oil in a large pot over medium heat. When the butter is melted, add mushrooms, onion, celery, garlic, and thyme. Cook, stirring frequently, until vegetables are soft, about 5 to 6 minutes. Sprinkle the vegetables with flour, and stir to combine. Season with a pinch of salt and pepper. Stir constantly for 3 minutes, allowing the flour to cook. Slowly add sherry and honey, stirring while you add. Then, slowly pour in the vegetable broth, still continuing to stir. Bring the pot to a simmer, and cook 20 minutes, stirring occasionally. Using an immersion blender, blend soup. If you don’t have an immersion blender, a standard blender will work. Just be sure to cool the soup before blending. Once blended, add half-and-half, and simmer 5 minutes. 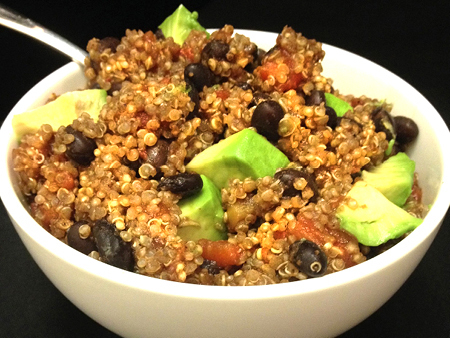 This recipe calls for cooking quinoa in a mixture of water, black beans, diced tomatoes, and spices. Why? The quinoa soaks up the liquid and a ton of flavor, leaving you with a thick, satisfying chili that’s packed with plant-based protein and fiber. It’s a great option when you want something easy, hearty, and healthy, say Lyssie Lakatos, R.D.N., and Tammy Lakatos Shames, R.D.N., authors of The Nutrition Twins’ Veggie Cure. You can also add a little extra protein with a dollop of plain Greek yogurt. What to do: Heat olive oil in a medium pot over low heat. Once the oil is hot but not smoking, add cumin and chili powder. Stir for 30 seconds until fragrant. Add quinoa, black beans with liquid, tomatoes, and water to the pot. Season with salt and pepper. Bring the mixture to a boil. Reduce heat to a simmer and cover. Cook for about 15 minutes, stirring occasionally, until quinoa is done and most of the water is absorbed. Serve with avocado and Greek yogurt, if desired.